After about an hour, we turned off the main road and headed down a rocky track and into the tiny village of Amed. 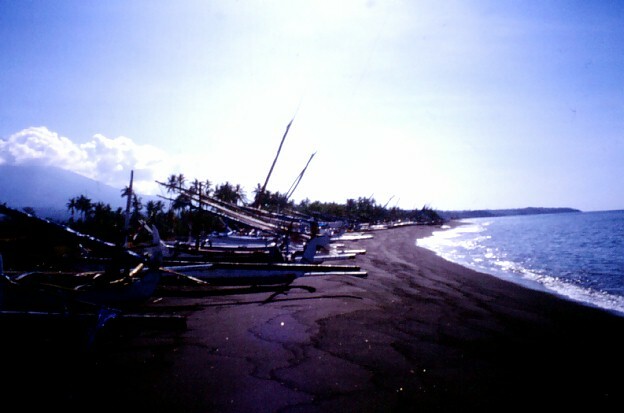 A long black sand beach (black lava and ash from the volcano Gunung Agung) stretched for miles. There was not a soul about, save for an occasional farmer working in the fields. 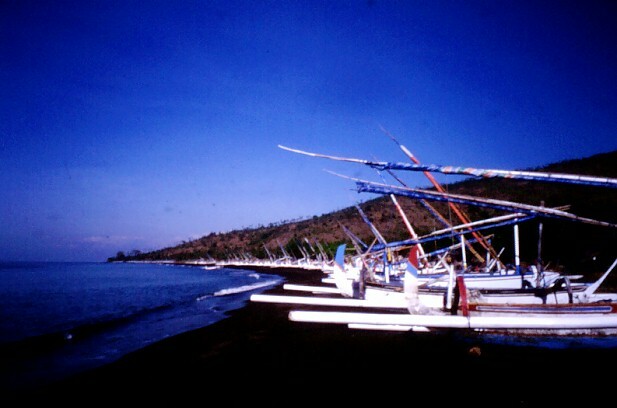 These prahus - fishing boats - were pulled up on the beach. 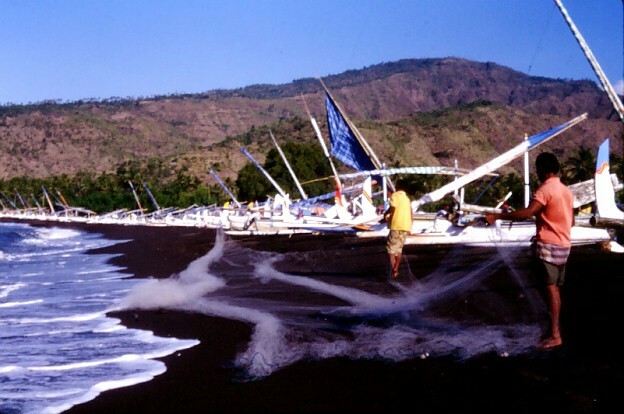 We came upon these people fixing their fishing nets. 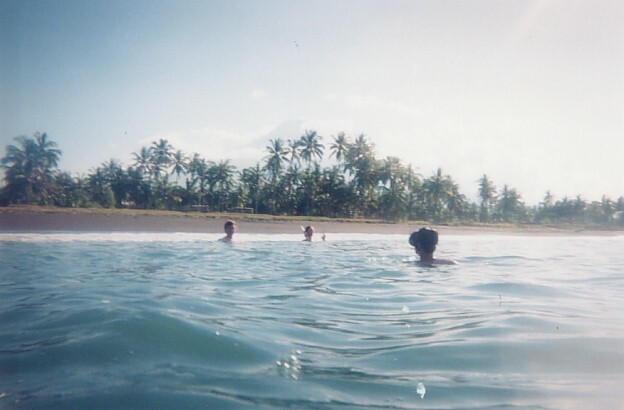 We decided to take a swim in the ocean. This is Dan, with me and Julia in the distance. The water was really refreshing after the heat of the day. We had the place completely to ourselves. Dewa had thought there was good snorkeling, but maybe further out - we didn't see anything much here. It was just nice to cool off in the water. Dewa thought there were more fish there at new moon than at full moon, which was just a couple of days ago - when we were at the Singapadu temple festival. 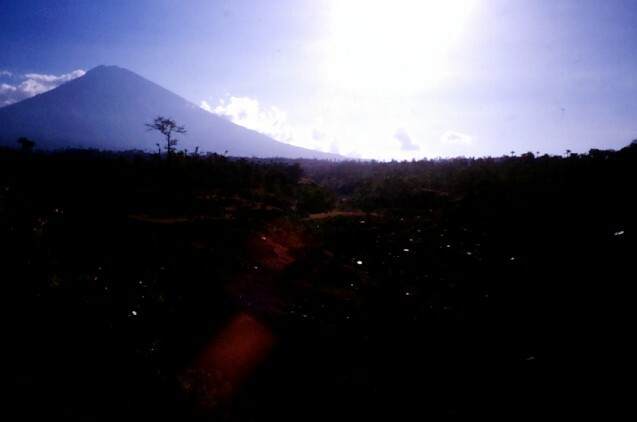 The great volcano Gunung Agung loomed over the scene like a silent sentinel. 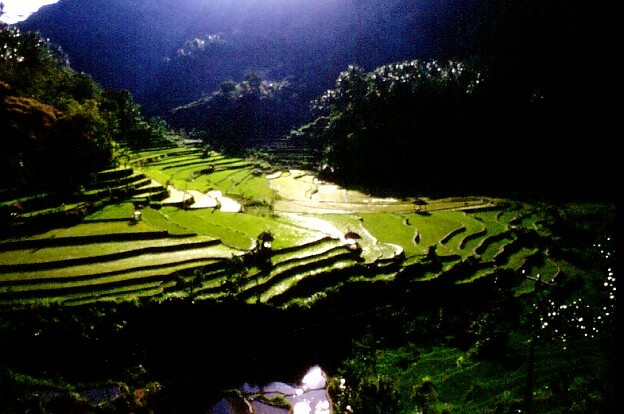 It seemed easy to understand how the Balinese felt that this mountain was sacred. It was already 3:30 by the time we arrived at Amed, and Dewa wanted to be back by 6:30, so we only had about an hour in Amed before we had to leave for the long drive back. The lush green countryside seemed more beautiful everywhere we looked. The drive back only took a couple of hours, and we were back in Ubud by about 6. We said goodbye to Dewa and thanked him for another wonderful day. Time for a great evening meal at Tutmac's restaurant - one of our favorites - with Linda and Justine - and so to bed.